"It's kind of funny, you know. Everybody's talking about how this is the year to hit some times and see what you can run. What I was realizing in the last year or so is, the more often I focus on times, the less I'm able to do in a race. If I'm in a race to compete and to win, I run pretty well and I run decently fast. But whenever I go into a race thinking, 'oh, I'm going to try and hit these splits and hit this pace, and I want to be at this time at the quarter, eight (800), and 12 (1200),' I don't know what it is, but it doesn't do it for me." - Miler David Torrence, who now trains with John Cook's group. Why can't I run a full marathon at half marathon pace? Will Josh Cox win the Comrades race in South Africa? I ran 3:54 1500 and a 24:38 8k. Can I say I am a badass? *Great Read: 75th Anniversary Of Jesse Owens' 4 WRs In 45 Minutes At Michigan Sports Illustrated ran this piece to mark the 75th anniversary of Owens setting WRs in the 100, long jump, straight 200 and 200 low hurdles in less than an hour. *Relaxed Running - Old Interview With Sprint Coach Bud Winter Unearthed As Winter humorously explains, one of the most overlooked keys to running (sprinting or distance) is to relax. To get re-energized with the keys to proper training, check out any of our LetsRun.com Training Talk audio interviews. Mary Keitany To Face Linet Masai In BUPA London 10k Mary Keitany has been untouchable on the roads, especially at the half marathon - 25k distances. We'll be interested to see if track 10,000m world champion Linet Masa, who just ran 14:31 in Shanghai, can upend Keitany in London. Recommended Read: Former Ivy 800m Runner Writes Great Piece On Genetics And Speed For SI.com Nature or nurture? Genetics or environment? What are the genticists finding out about specific genes and how they relate to sprinting? Former Canadian 1,500m record holder, NCAA 1,000m record holder and 1988 Olympian Doug Consiglio wrote us a great email about Charlie Francis' impact on the sport. His take - as a runner who refused to cheat and take steroids - is that Francis set the sport back for decades in Canada and repeatedly and unabashedly sent the wrong message that it's okay to cheat if other people are doing it. Mack, a former LAPD officer, was part of the Rampart scandal. He went to jail for bank robbery but was a suspect along with fellow Oregon teammate Amir Mohammed in the murder of Notorious B.I.G. We hope Mack turns his life around but reports are he became an avowed member of the Bloods gang while in prison. Recommended Read: Coaching Advice - Jerry Schumacher Speaks We found this interview inspiring. Sanya Richards Suffering From Bechet's Disease Flare Up We found this article fascinating. Sanya Richards talks about dealing with Bechet's Disease, the symptoms of which appear after especially stressful episodes like her platinum wedding to NY Giant Aaron Ross. *USATF Occidental Results Leo Manzano and Russell Brown raced to the wire in the 1,500 with Manzano getting the win and Brown a PR, both in 3:36. *Video/Results Runnerspace was there with coverage of the women's 800/1,500 races where some big name pros stepped down in distance. Treniere Clement won the women's 800 and Nicole Edwards was the surprise 1,500 winner. *Boards: JennyB - 4th, Clement - 1st, More results to Come Tonight! Rowbury 4th! Former Jamaican Sportsperson Of The Year Incensed With 2-Year Ban Chris Williams, 38, is appalled at the way he was treated by the JAAA. Kara Goucher Talks About Popular Jordan Hasay And Pregnancy Doug Binder got Kara Goucher to agree that Jordan Hasay is the most popular female runner in Oregon. Not exactly. This year in outdoor track we have the Pure Regional system. Last year was regionals plus time qualifiers. The NCAA plan for next year may likely be a totally different version. As a way of looking ahead, we took the time to find out exactly who would make NCAAs this year if the proposed "Wilson Plan" or "24/8 Plan" was already in place. More Results: USA's Karjuan Williams Runs 1:45.79 For 5th In Brazil The X-Man won the slower of two 200m heats and the men's 5,000 was won in 13:17 in this IAAF World Challenge meet attended by a number of US sprinters. *Festival Of Miles Elite Men Video 2 guys broke 4:00 in Missouri, led by Andy McClary. In the new system starting this year, the top 48 D1 performers in each event from the East and West compete for 12 spots in their region. Combine the top 12 from East and West to make the 24-person fields in the NCAA finals in Eugene. Lance coming up live on Sportscenter, getcha popcorn ready! Seriously, is cycling dirtier than T&F? 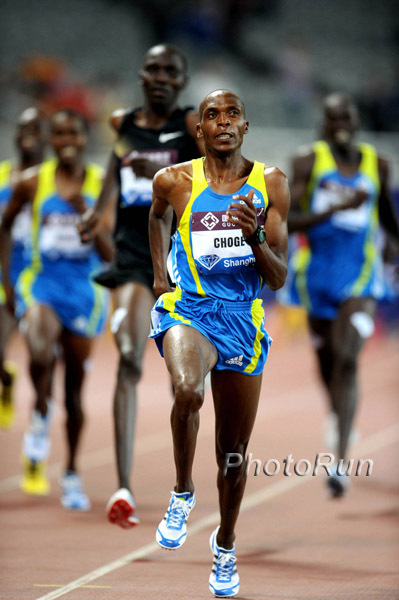 Usain Bolt, Jeremy Wariner and Liu Xiang highlight Sunday's sprinting action and we'll also see many of the top African distance runners square off, including Asbel Kiprop and Deresse Mekonnen in a loaded 1,500, Pamela Jelimo and Jenny Meadows in the 800 and Linet Masai in the 5,000. Plus field event fans will like to see Irving Saladino (PAN) vs. Dwight Phillips (USA) vs. Fabrice LaPierre (AUS) in the 2nd of 12 Diamond League meets.